Come and learn about High Hopes Therapeutic Riding and all that we do. Find out about the wide range of volunteer opportunities that are open to you, and consider which volunteer opportunities will suit you best. All volunteers must attend a General Orientation prior to volunteering. 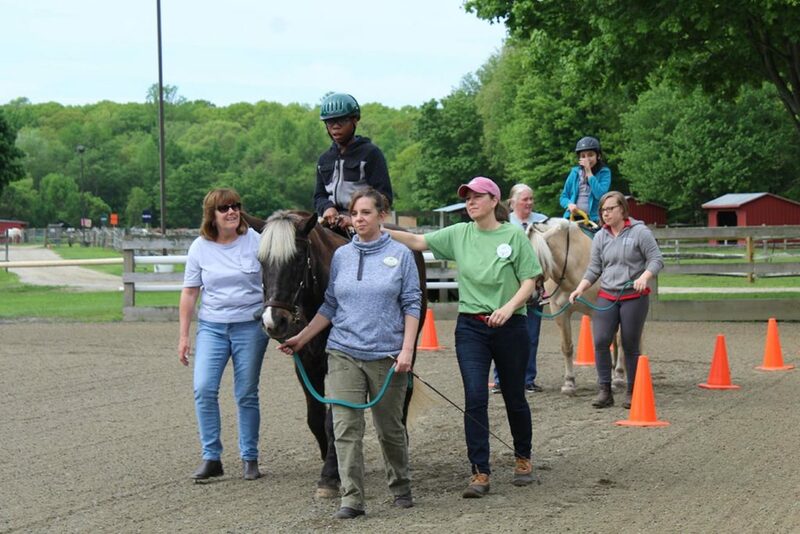 The General Orientation begins in the classroom with an overview of High Hopes Therapeutic Riding, who we serve, our horses, and our policies and procedures. It also includes a tour of the facility. At the General Orientation, volunteers will choose a role(s) they are interested in and will be scheduled for an additional training specific to that role. Roles may include sidewalker, horse leader (experience required), feeder, office volunteer, etc. Sidewalker training includes more in-depth information about providing service to the High Hopes participants and an opportunity to practice hands-on sidewalking techniques that will prepare new volunteers to begin working with riders. For those with horse experience interested in becoming horse leaders, additional training opportunities will be available to learn and practice our leading techniques. Wear closed toe shoes and weather appropriate clothing (we will be outside, in the barn and in the indoor ring). If you have not completed your release form online please bring them with you.